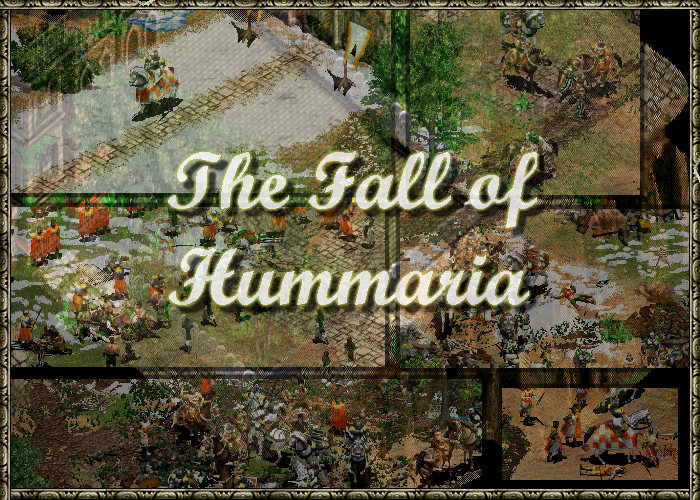 This is a revamped version of my cinematic "The Fall of Hummaria - Teaser". Expect some extra scenes, spelling/grammar fixes and much more! Once upon a time there was a powerful and rich kingdom called Hummaria. It prospered until one day its king fell ill and perished. Without an heir, the royal house disappeared and a rich nobleman was elected king. The new king quickly turned out to be a terrible ruler, desiring only wealth and pleasure. Any sign of disobedience from the country's citizens was dealt with harshly. The years went by and the population grew ever more dissatisfied with its ruler. At age sixty the king died, leaving the throne to his son Elliard. Though completely different from his father, Elliard was perceived to be just as bad by the people of Hummaria. At the very first day of his reign a rebellion broke out. Despite various attempts by the king to resolve the situation with ringleaders Jordan and Aspen, no progress was achieved. There were not many options left for Elliard, but he eventually decided on probably the worst of them: repression. He followed in his father's footsteps, killing all rebels. Women and children included. It was of no use. If anything, it only served to further anger the population. Yet Elliard had already gone to far to halt his repression. The rebels' numbers increased over time as many of Hummaria's citizens chose to join the resistance. It did not take long for them to fight the guards. Soon the rebels outnumbered the Hummarian army and the guards stopped following Elliard's orders. The king was facing a cliff... His own men against him, he was left with only the most loyal of his servants. In a final struggle to defend the kingdom they were unable to hold back the rebels. Elliard has no other option but to await his fate. Cinematic completely revamped (changes at the scenario design, dialogues, extra scenes, etc...)! If you liked it, please leave your comment here! Overall I found the cutscene to be nicely executed and a pleasure to watch. A great deal of the ingame text did contain either grammatical or spelling issues, something which at times kept me from getting drawn in. The same applies to certain sentences in which the author's choice of words could probably be improved. The core mechanics of the scenario are often quite simple, but near-perfect in its execution. There were some minor issues in few scenes where in my opinion the pace dropped just a tad too much, but in general the cutscene ran smooth and without any hiccups. Although the author did a good job of implementing basic tricks, I found the scenario not particularly creative. The music used fit the cutscene, but occasionally distracted me from the events on the screen. It would have perhaps been better had the author chosen some less prominent tunes. The author did a fantastic job at creating a realistic looking world. The map looks good and pleasing to the eye, although at times there were instances where the 'path'-object extended into the fog of war, giving a slightly untidy impression. Overall there was in my opinion little that the author could improve on. What on paper seemed like a rather cliche storyline turned out to be surprisingly original. I don't believe we have seen a scenario portray the struggles of a reluctant king in such a manner. What bothered me personally was the fact that the author decided to set the scenario in Europe, when any sort of fictional world would have probably been more fitting. The instructions were simple and easy to understand. As in most cinematic scenarios the author gave the player the possibility to correctly configure the game settings before launching the cutscene proper. "The Fall of Hummaria - Teaser" is as well executed cutscene and a recommended watch. Don't expect any ridiculously fancy tricks, but instead sit back and enjoy a good solid cinematic. About the grammar/pace/paths I'll try to fix as soon as I can. Dead_End, could you update the review (according the v2.0) when/if you have time please? I have to say that this was brilliant and the dialogue was executed effectively. (despite there still being one or two grammatical errors) Also the assasination seemed a bit strange as the Tuetonic Knight just walked into view and there was an arrow sound. This scene should be fleshed out a little more, but overall a brilliant teaser. The music was chosen well to suit the fast paced battle scenes and quietened for dramatic effect, which was used perfectly, there is nothing that I would change about this. Overall it was a feast for the eyes, the carpets made a good regal floor and the use of path 4 around the mountains was good. My only real qualm here is the random use of Ice patches. ( They look good but a bit overused and in strange places ) Also the appearance of the roman ruins at the end was also a bit wierd as they are in front of the destroyed building. The story was an interesting idea, that grabbed my attention. It was a little too slow at parts, but that just adds to the emotional scenes. I would have to say the only flaw would be that it maybe gives away too much of the story for your upcoming project. A brilliant piece of work and a must-watch for everyone. And the ice tiles are supposed to simmulate the ice melting (under torches, plants, etc). Some scenes I admit that were too slow (Maybe I fix them later). Don't worry, there will be much more (new) things to see in the first playable-scenario. The teaser is supposed to be only a short brief of the story. PS: How many people went back after watching it, used Marco/Polo, and found Jesus? Thank you, TKanic! The first playable part is *near* to come! *It will be avaliable for playtesting soon (maybe in 1 month or 2). However, it will be released only after fixing all bugs and grammar errors.